I had a book once that I highly recommend to other wives called "The Power of A Praying Wife." It is a great book by Stormie Omartian. It gives examples of prayers to pray for our husbands in the various areas of his life. I loaned it to a friend of mine a few years ago, and told her to keep it as long as she needed it. It has not been returned yet, which is fine, so I figured I might just need to go buy another copy of it someday. Then, I was given the opportunity to review "Praying for Your Husband from Head to Toe" by Sharon Jaynes. This book by Jaynes is similar to Omartian's book in that it gives prayer examples. However, it is also very unique in the way it lists the prayers. 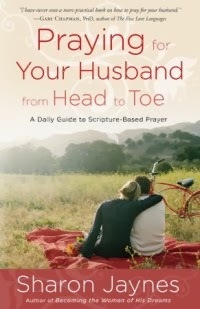 The author explains what it means to pray for your husband from head to toe, mapping out 16 different areas to concentrate on. Then, there is a 30-day guide to follow, which can help develop consistency in your prayers, and teaches you HOW to pray for your man, using Scripture as a guideline. I will still continue recommending Omartian's book to other wives, but this one by Jaynes is just as good. In fact, if you are looking for a NEW way to help you deepen your prayer life, be more consistent in praying for your husband, and want to strengthen your marriage, I highly recommend it. To put it simply, I like it, and will continue using it. Take a peek at CHAPTER ONE, and see what you think! NOTE: I received this book for free from Blogging for Books for this review.